The NCAA dominates the month of March with the college basketball tournament. The highly promoted event isn’t just huge for sports fans. Marketers from all industries use this cult-like attraction as an avenue to catapult their brand visibility. March Madness offers brands a center-stage platform for integrating themselves into the tournament through paid ads in online and offline media outlets, social media conversations, branded placements, and experiential events. March Madness is a business – a savvy enterprise with many lessons for marketers. Lesson #1: Play like it’s a single elimination game. March Madness is a single elimination sporting event. The internet has changed the pace of business. Pre-internet, marketers had ample time to plan, develop and execute a new campaign. Not anymore. Jack Welch, GE’s former CEO, said that, “If the rate of change on the outside exceeds the rate of change on the inside, the end is near.” In a fast changing world, two things matter: speed and adaptability. Lesson #2: Use your data. Data analytics is big business when it comes to basketball. And, basketball is a complicated sport to analyze. Unlike baseball, which is made up of discrete contests between individuals in predictable locations, like a pitcher versus a batter, basketball involves five players per team interacting with each other in an infinite number of ways. In 2009, the NBA started using a video system that tracked the movement of every player on the court, and the ball, 25 times a second. This new information allowed data scientists to use machine learning and cartography to help determine which players were helping their team win. The most profound change to basketball as a result of analytics is the rise of the 3-point shot. Data shows that while a 3-pointer has only a 35% chance of going in, it can lead to more points than a 2-point jump shot taken closer to the basket. How can you use data to uncover a business opportunity that may not appear to be a slam dunk? Lesson #3: Deliver an element of surprise. 16-seed UMBC’s stunning upset over 1-seed Virginia hasn’t been the only surprise of this year’s contest. March Madness has been full of shocks and delights. It’s one of the reasons why TV viewership is up 4%, social media engagement has increased 16%, and video views have catapulted by 68% versus last year. Remember WestJet’s Christmas miracle campaign in 2013? Few campaigns have a life of years – but WestJet nailed it. With the help of 175 WestJet volunteers, three airports and Santa, WestJet made a Christmas miracle happen for more than 250 guests on two Calgary-bound flights. Prior to boarding, customers, via live video, told Santa their wish requests. Then, after the passengers boarded their flight, hundreds of employees rushed to stores to make the wishes come true. After wrapping each gift and labeling them by name, flyers were shocked when the baggage claim conveyor belt was flooded with the gifts they had asked for. When done well, surprise marketing strategies are effective because they create raving fans and go viral. How can you surprise and delight your customers? Lesson #4: Create a community. When a sports team from a geographic area is successful, it can bring people with different backgrounds but similar cheering sympathies together. It gives us something to talk about with people with whom we otherwise may not converse. How can you bring your customers together? While they may be from different industries, geographies or organization-types, it’s likely they have similar challenges, questions or results. Lesson #5: Make it personal. Creating an emotional connection with customers can transform a short-term transactional relationship into a long-term partnership. Loyola-Chicago’s biggest NCAA fan is the team chaplain who prays with the players before games and gives them scouting reports the next day. 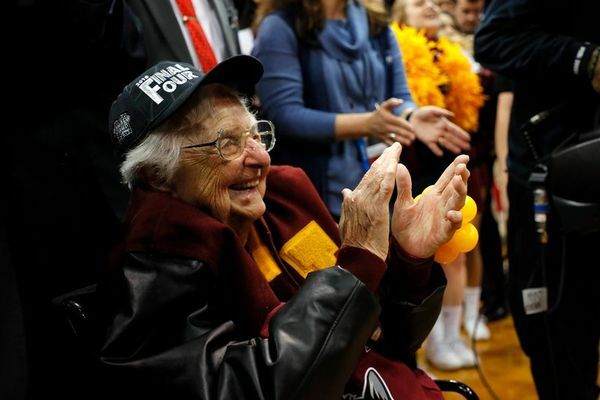 Did I mention that this superfan is 98-year old Sister Jean Dolores Schmidt? How about that Loyola-Chicago, the 11 seed Ramblers, unknown to most of the country entering this tournament, are now nearly a household name and playing in the Final Four? Add a personal touch to your customer’s experience and you’ll be remembered and maybe even revered. Marketing in 2018 is far from a slam dunk. Learn from the NCAA to catapult your Brand.